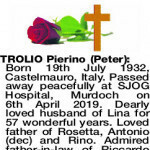 The Funeral Mass for Mr Pierino (Peter) Trolio of Hamilton Hill will be celebrated in St Joseph Pignatelli's Church, 18 Galloway Street, Attadale commencing at 10.30am on MONDAY (15.4.2019). The Cortege will leave the Church at the conclusion of Mass and arrive at the main entrance of FREMANTLE Cemetery, Carrington Street, Palmyra at 11.45am for a Burial Service. Please assemble at Samson Pavilion at 11.35am. Vigil Prayers and Rosary will be recited in St Joseph Pignatelli's Church, Attadale at 7pm on SUNDAY (14.4.2019). No Flowers by request, donations in lieu to Red Cross. The most heartfelt condolences to you all. Le più sentite condoglianze a voi tutti. Born 19th July 1932, Castelmauro, Italy. Passed away peacefully at SJOG Hospital, Murdoch on 6th April 2019. Dearly loved husband of Lina for 57 wonderful years. Loved father of Rosetta, Antonio (dec) and Rino. Admired father-in-law of Riccardo and Maria. Treasured Nonno of Claudio, Sophia and Isabella. The Trolio family would like to thank Dr Jayaraman, Dr Gangatharan and all the staff at SJOG Hospital, Murdoch for their kind and respectful care. Deep in our hearts a memory is kept, of one we loved and will never forget. 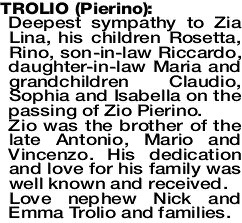 Deepest sympathy to Zia Lina, his children Rosetta, Rino, son-in-law Riccardo, daughter-in-law Maria and grandchildren Claudio, Sophia and Isabella on the passing of Zio Pierino. 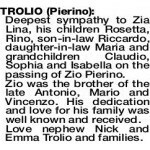 Zio was the brother of the late Antonio, Mario and Vincenzo. His dedication and love for his family was well known and received. Love nephew Nick and Emma Trolio and families. 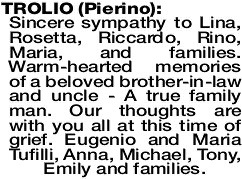 Deepest sympathy to Aunty Lina, Rosetta, Riccardo, Rino, Maria, Claudio, Sophia and Isabella on the passing of Uncle Peter who we remember with fondness. Mario, Maria and Mason. 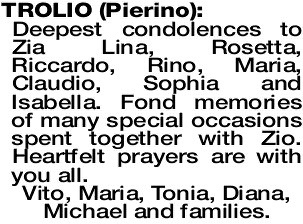 Deepest sympathy to Zia Lina, Rosetta, Ricardo, Reno, Maria and families. Uncle Peter was a kind man, respectful and always eager to share his goods from his garden. RIP. Angelo, Lena, James and special love from Tia. 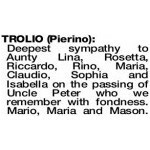 TROLIO PIERINO Fond memories of our loving Uncle Peter. Deepest sympathies to Zia Lina, Rosetta, Riccardo, Rino, Maria and families. Rest in peace Angelo, Louise, Rose, Mark and families. 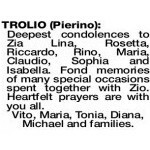 TROLIO PIERINO Expressing deepest sympathy to Zia Lina, Rosetta, Riccardo, Rino, Maria, Claudio, Sophia and Isabella on your loss. Zio, your positive and welcoming nature will be missed. Wishing you all peace at this time of sorrow. Dominic, Dolores, Liam and Sinead. 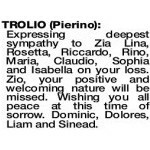 TROLIO PIERINO Deepest condolences to Zia Lina, Rosetta, Riccardo, Rino, Maria, Claudio, Sophia and Isabella. Fond memories of many special occasions spent together with Zio. Heartfelt prayers are with you all. Vito, Maria, Tonia, Diana, Michael and families. 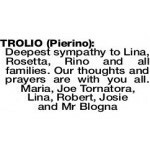 TROLIO PIERINO Sincere sympathy to Lina, Rosetta, Riccardo, Rino, Maria, and families. Warm-hearted memories of a beloved brother-in-law and uncle - A true family man. Our thoughts are with you all at this time of grief. Eugenio and Maria Tufilli, Anna, Michael, Tony, Emily and families. 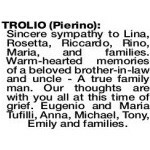 TROLIO PIERINO Deepest sympathy and love to Lina, Rosetta, Ricardo, Rino, Maria and families. Our thoughts and prayers are with you all. Fond memories of our family times together. May he rest in peace. Gina, Len, Tonia, Elliarna and Christopher Paparella. 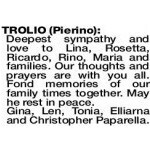 TROLIO PIERINO Condolences zia Lina and family. 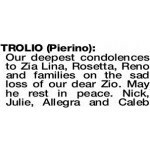 Zio is now at peace in God's care. Always caring thoughtful and kind, what a lovely memory to leave behind. Ninetta, Pasquale and family. 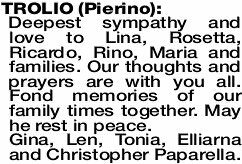 Deepest sympathy to Rino, Maria and families on your sad loss. Our thoughts are with you. Danny, Maria and family, Luigi and Angela.